Watch Khloe Kardashian Tell Her Family She's Pregnant and See Kylie Jenner's Super Sweet Reaction: "I'm Going to Cry!" The Kardashians are crying so many happy tears! Khloe Kardashian announced her pregnancy to her family and friends on tonight's special episode of Keeping Up With the Kardashians. 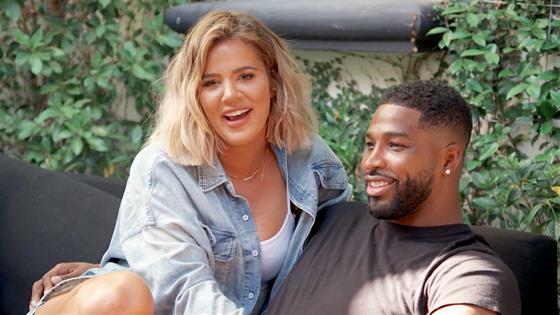 Khloe and Tristan Thompson decided to break the big baby news during a family barbecue, which brought the Kardashian-Jenner clan together with Tristan's family. "I think it's perfect timing that my family's here and all your family's here to unite as one," Tristan shares in the emotional recap video above. "And we have an announcement. KoKo, wanna throw the hammer down?"" "We're having a baby!" Khloe announces as her family and friends freak out and beginning congratulating Khloe with hugs, kisses and lots of happy tears. "It feels so good to tell everyone and everyone's so excited. I'm happy that I get to talk about it now with my sisters," Khloe later admits. "I feel really blessed." Kendall Jenner and Kylie Jenner are not in attendance, so Khloe and her sisters decide to FaceTime them to share the news. "Well you missed the barbecue and I really wanted to tell you something," Khloe tells Kylie, who instantly asks, "Are you pregnant?" "I'm pregnant!" Khloe tells Kylie, who has the sweetest reaction. "Stop! Are you kidding because I'm going to cry?!" Kylie squeals. "I'm so happy for you! And Tristan!" Later, Khloe and Kim Kardashian laugh about the fact they are both expecting children. "It's different that we're doing it together," Khloe smiles. Kim replies, "I wish that like I was actually pregnant, but you know…"
As for Kris Jenner, she can't stop crying and hugging Khloe. "I just never thought that this one was going to be able to have a baby," Kris says. "I just want you to be happy." See Khloe's sweet pregnancy announcement, plus more must-see moments from tonight's KUWTK, above!